Often it feels like kids today don't have the same type of imaginations of older generations and all too often rely on TV to keep them busy. The Monkey Preschool app is one that can be used on your iPod touch, iPad, and iPhone as a way to encourage your child to use their imagination in a fun and playful way. This app is meant for kids ages two years and up and will have them thinking about what they want to be when they grow up. It's the question that all kids think of: what do they want to be when they grow up. Because young children have pretty active imaginations you can expect some pretty extreme answers such as wanting to grow up and be a princess, pirate, or astronaut. With this app kids will get to open the toy box and look through a variety of toys that are interactive. Kids will be able to dress up their monkey however they like as there are literally hundreds of items for them to try on. This app basically acts as a virtual costume box. There were some minor adjustments made to the app in the most recent update and right now it has 3.5 out of five stars from users. It's meant to be used by kids ages five and under and would really appeal to the toddler age group. Thanks to this app having such a child-friendly user interface you can encourage independent play. There is no way that kids will accidentally click on a link they shouldn’t, be confused by menus and endless instructions and options, there are no ads, and the app doesn't collect personal information. Kids are able to just play as they wish in a child-safe environment. They will begin by picking the monkey they wish to dress up; there are four to choose from. There are all kinds of dress up items and interactive toys to play with and kids are free to make any combinations they want. The app is always encouraging and offers rewards to kids in the form of stickers. These virtual stickers can be placed on their preschool wall. There are surprises to be revealed all the time and the sound effects and animations really appeal to the kids. There is no set start or finish to a “game;” instead it offers endless play. 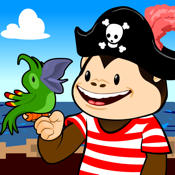 The Monkey Preschool app for your iPod touch, iPad, and iPhone can be enjoyed as a fun little game that encourages your child to be creative and imaginative.